The dire wolf leaps at me, its snarling mouth revealing terrifying long fangs. Its shiny blue coat is offset by flying shards of red, yellow and white, and its eyes glow an otherworldly yellow. 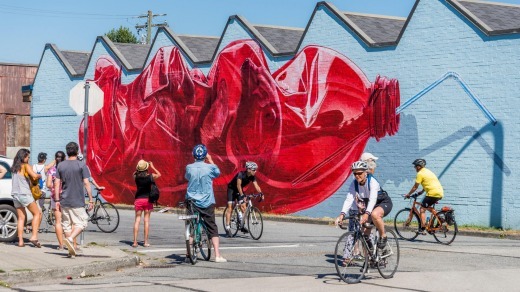 It's a piece of street art, but a fiendishly dynamic one; part of a set of wolves that were painted by artist Ben Tour for the first Vancouver Mural Festival in 2016. Lurking behind bins, they stand ready to surprise the passer-by. It seems apt that my wolf seems to emerge from behind a coffee roaster's parked van on this sunny day. Both coffee and the murals hint at the gentrification of this former working-class neighbourhood of Mount Pleasant. South of the city's Downtown, Mount Pleasant was once known as Brewery Creek and was an industrial hub. 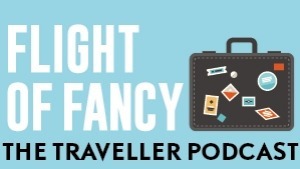 In the 21st century, its handy proximity to the city centre has seen it transform. Part of that process is the Mural Festival, which adds new works to the area each summer. 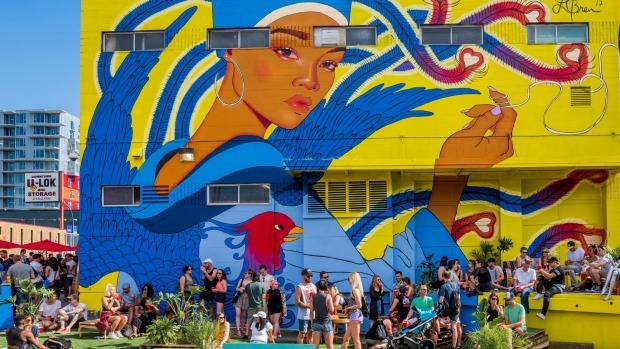 Between festivals, visitors can explore the artwork via two weekly Saturday walking tours, each exploring a different selection of murals. My tour guide today is Tom Nichini, a keen believer in art's ability to engage. "When the community is walking by and they see this mural going up, there's a sense of ownership and pride in it," he says. 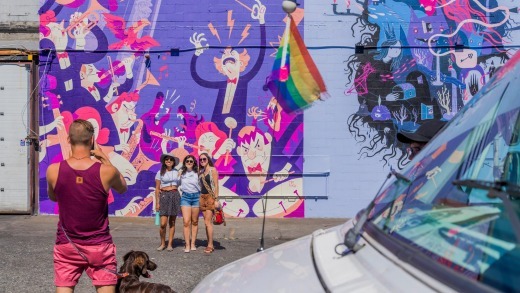 "On the scale of the Mural Festival, the community-building aspect is huge. Though the festival is part of the development and transition of neighbourhoods, it helps people have a stake in it, and creates connections." There's a great diversity of pieces in these back streets. After the wolves we encounter another mural forming a backdrop to bins – Hand Hug, a large colourful piece of surrealism by Berlin-based Andrea Wan. Tree trunks and human features intertwine in Dali-esque fashion against a night sky, wrapping around these walls behind busy Main Street. It's all about consciousness rising forth, says Nichini, and I have no reason to doubt him. It certainly brightens up the alley, as does the nearby Sutton Boys, featuring kids playing among trees and grassy fields. You couldn't imagine anything more different than the scrappy urban grit of Mount Pleasant, but maybe that's the point. A dose of realism comes via the biggest piece we encounter, The Present is a Gift. Stretching across two heritage apartment buildings, it depicts two locals: a young woman of First Nations descent, and a popular optometrist who's practised in the area for decades. There's a cluster of smaller works in the nearby laneways, intriguing for their subject matter and styles. One vibrant abstract piece is the first mural ever painted by a local tattoo artist; another is a cryptic signature-like ''tag'' which could only be allowed by bending the city's strict anti-graffiti rules. As in my home town of Melbourne, city authorities can be confusingly schizophrenic about street art – promoting it with one hand, restricting it with the other. "The relationship between graffiti writers and the City of Vancouver has been pretty negative," says Nichini. "But the city has a new head of public art and already this year they've allowed one 'hero wall' to get up, which allows tags. Hopefully by the end of this year we'll have a freewall up, where anyone in the city is allowed to paint as long as they follow certain rules." This governmental caution makes the next mural even more surprising. It's intended as a protest against police brutality, with silhouettes of demonstrators and helmeted riot police contrasting with red and yellow flames. Though it doesn't identify a specific time and place, it packs a punch. Further north is a selection of funky skateboarding wolves; unauthorised, we're told, but later made legit. 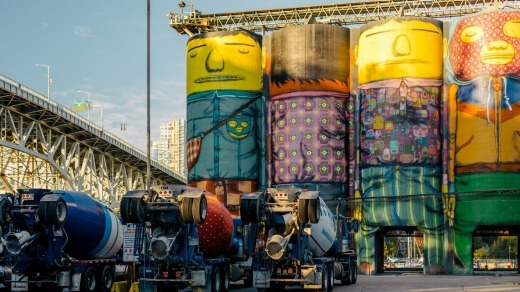 That process seems a metaphor for Vancouver's evolving attitude to large-scale street art: tentative, but open to the pleasure it brings. Giants by Os Gemeos on Granville Island. For the next festival, says Nichini, another 30 pieces will be painted in this unnamed alley alone. And they'll remain accessible all year via these tours. "People like hearing the stories behind the murals," he says. "On the tour you can see the art and appreciate it, and hear about its production. You end up learning stories, and some of the issues and culture of the neighbourhoods of Vancouver." 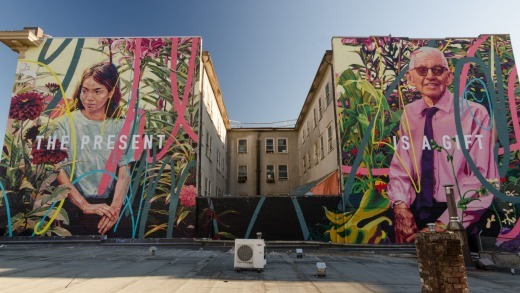 The Present is a Gift by Drew Young and Jay Senetchko. 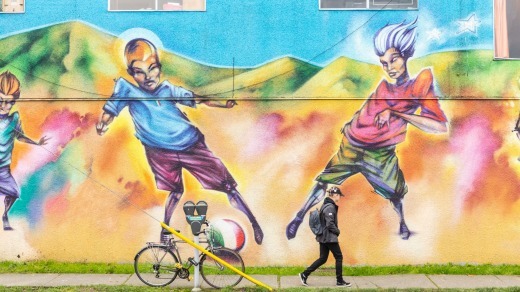 Public art mural in Commercial Drive neighbourhood. The Burrard, theburrard.com Former motel, now a cool retro-chic hotel in a central location. From $105 a night. Mural tours take place at 11am and 1.30pm each Saturday, departing from Kafka's Coffee & Tea, 2525 Main St, Vancouver. Fee $C20 for one tour, $C30 for both. Book via vanmuralfest.ca or pay at location.